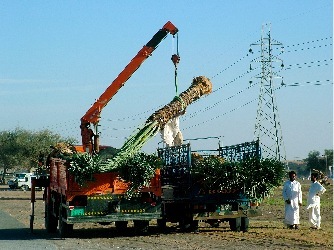 With all the building work in Dubai comes an enormous demand for palm trees. Luckily, they are extremely resilient and can be transplanted even as are fully matured plants. How do you keep chocolate eggs cold in the sand? How do you hide a basket of brightly coloured eggs in plain yellow sand dunes? All the questions we never had to address when we had our easter egg hunts in Germany. This Easter we had visitors from India, who were keen to get out into the desert. So we combined the two events and had an easter egg hunt in the dunes. After Stuart had explained the significance of bunnies and eggs to the Christian tradition we arrived in Falaj al Mualla near Ras al Khaimah, an easy stretch of dunes near a camel race track, where the first-timers could thrash the cars through the dunes. After a while we found a shady spot under a stand of trees, perfect for lunch. While Stuart made tea, Anna went off to hide the easter egg boxes we had designed to withstand the gruelling desert conditions. The baskets had been stored in a cool box on the way out, to give the chocolate a fighting chance in the burning March temperatures. We had packed everything into individual tupperware boxes to keep out the sand and insects. The challenge was hiding these treats in the featureless dunes and under the few straggly bushes. Once this was done, everyone fanned out to find their easter egg box, as quickly as possible, before the chocolate bunnies dissolved or the beetles got in them. After much shouting and re-hiding of treats we finally got to scoff melting sweets and warmed up hard-boiled eggs with our tea and lunch. Divine! So that was definitely one of the weirder Easter events of my life, not really comparable with our childhood trips shivering into a forest dripping with thaw, where we would invariably come back with fewer baskets than we took out with us, some always got lost in the dim darkness of the German woods. Mark was lugging round vast amounts of camera equipment at all times, but it was worth it. A selection of his stunning pictures can be seen here (at least for a time). You can even tell him how fab they are (if you can find your way round the German website). Dubai is blessed with a lot of stunning hotels, which are really more than just places for visitors to sleep. The have great restaurants, beach clubs and shopping centres, so it is easy to meet and spend time there. In fact sometimes I feel like one of those jet setters who spend their lives passing through and living off room service. So since I know that some of you are particularly appreciative of a well-maintained lobby I shall endeavour to write an irregular series on the hotel lobbies of Dubai, their facilities such as who provides free wifi and where the best orange juice is served, as well as pictures of stunning glass lifts and expensively decorated atriums. Today I will start with the Emirates Towers Hotel, since it's closest to us and quite the place to be seen. I spend a lot of time there, meeting Stuart for lunch at the Noodle House, a Thai version of Wagamama, or hanging out at Starbucks. The base of the two hotel towers is a shopping centre of the flashest kind, with D&G, Prada and Dior, etc. But since I'm not a size 8 I go to the hair dresser instead (Tony and Guy is truly everywhere), or the newsagent, or to the copy shop who does a great job of printing my photos. The lobby serves a splendid Turkish coffee with lots of tidbits on the side, such as sticky-sweet baklava and little dark chocolate nibble, as well as four (!) different kinds of sugar. Completely OTT. It also sports one of the first glass lifts I sampled in Dubai, and it featured in my first Dubai short film, so it holds a special place in my heart. The best thing about it is that it goes up on the inside of the lobby walls and passes through two intermediate floors, so you can look straight into the drinks of the guests on the bar and executive lounge floor. Cool . Mercifully easy to find (if you know how scary it is to drive in Sharjah, where there is no roadmap in existence), after a detour through the vastness of Sharjah University, past the impressively pointless Sharjah monument, we reached this new zoo for a rainy day visit. 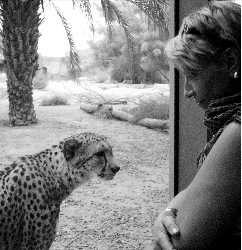 I have never been in a zoo that was emptier. Apart from a bus load of Dutch people there was not a screaming child of a whinging teenager in sight (not that the Dutch people screamed or whinged, all very civilised). Most of the time it was just us and the various snakes, spiders, scorpions, gekkos and lizards. Until we got to the outside habitats: Flamingos and other water birds balancing on one leg; Ostriches and antelopes of varying sizes strolled round together and in the distance we could even spot a few of the fabled oryx antelopes, extinct in the wild now, who were a source for the myth of the unicorn, since their straight long, closely set horns look like a single on from the side. We also spotted a rock hyrax, a small ratty looking thing, but which apparently is a distant relative of the elephant (it would be difficult to think of the shape of a land mammal that looked less like an elephant than this cat-sized furry animal). We spent a few days in Zanzibar to attend and film the wedding of one of Stuart's colleagues. Paradise! Even the rain was romantic, or maybe that's just me missing a good downpour? Sitting on the terrace for lunch we watched the rain. Low grey clouds had been moving in from the South all morning, obscuring the horizon line between sea and sky. Suddenly it hit us, a great swell of water on the wind. There were still boats out at sea, wooden dhows with sharply triangular canvas sails, calmly cutting through the waves as if the sky was still cloudless. Smaller rowing boats are plowing the waves, a lone rower trying to make his way back to shore against the push of the water in the air. On the terrace, as soon as the heavens broke, everyone moved back behind the line of the pillars that hold up the roof, carrying on their conversations, letting the waiters deal with the debris on the dripping tables. There was a clutter of plates, a fork falling to the ground, but shortly we were back to chatting and sipping drinks. It is not monsoon season yet, that doesn't start until the end of March, so this is just a taster. There seems to be little in the way of seasons here, as we understand them. Temperatures are constant at 26-32ºC, with monsoons twice a year and, surprisingly (to me as a Northern hemisphere inhabitant) the best time to visit is the summer, when the weather is balmy and the downpours non-existent. This rain, the sound of which I longed for when I had just left England last year, is quite different in texture and effect from the rain we left behind in Europe. There, rain is a signal to get indoors, turn up the heating and snuggle up. It's chilly, usually accompanied by an even colder wind, and getting soaked can be followed by serious illness. It can range in intensity from a light mist, like a cloud descending round your head, to gusting winds carrying icy drops mixed with snow. This monsoon comes in one flavour only. It doesn't mess about with drizzle, doesn't threaten and then disperse. It starts, it pours, it stops. Clouds arrive on the wind, it becomes oppressively hot and the light becomes murky. In no time the water starts falling from the sky in great gusting sheets, pounding the leaves of the lush trees, ripping blossoms off to float down the rivulets that form on uneven ground. The gutters overflow immediately, waterfalls pouring from the roofs to add to the general flood. Drops fall so hard that they bounce off the ground and spray up again. But it never cools down, and a good soaking results in nothing more than wet skin and coloured feet if you wear the kind of shoes where the leather dye runs. The monsoon stops as abruptly as it started. Then the sun reappears, and the puddles evaporate in the steamy heat. Everyone moves their tables and chairs back onto the terrace and carries on watching the boats. Living in a town where we have to grab what cultural events we can get our hands on we sometimes end up with strange combinations. Welsh opera and 80's Rock, anyone? Wales@Wafi was a little sales show to give us a taste of the attractions of 'Wales. World Nation'. 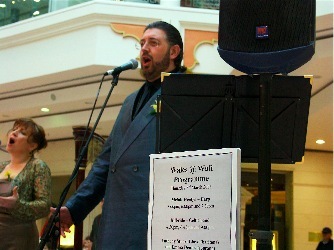 An interactive stand to show to geography of the place and a duet of opera singers were presented to attract the attention of bored designer shoppers. Sweet, but selling a friendly, inoffensive place like Wales with a slightly country-bumpkin reputation to these jaded visitors to the glitziest and emptiest shopping place of them all is going to be an uphill struggle. 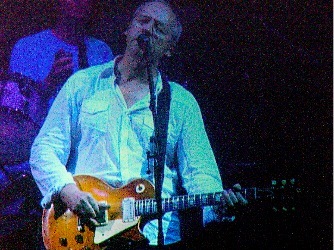 In the evening there was Mark Knopfler of Dire Straits. A whole other thing. This guy can rock on down. All the Straits hits and a lot of his own new stuff (links require iTunes to be installed), which was a great showcase for his superb guitar skills. The venue was great, too: the outdoor amphitheatre at Media City has good acoustics and when you get bored you can watch the big cranes with their bright spotlights swing round the Marina building site across the way with its 24-hour, non-stop operation like giant storks. Or watch the late-night workers in the media offices behind the back of the stage lit up by their computer screens. You know how winter is supposed to be the quiet time of the year, where apart from Christmas nothing much happens? This winter has been the busiest, most hectic and complicated ever. I have been to India, Egypt, the UK and France while Stuart has travelled to Paris and Brussels more times than seems feasible, as well as Hong Kong, Mumbai and Stockholm. We went on holiday to Egypt, then we had visitors. We went to Chennai, then had some more visitors. In between Dubai staged a film, a shopping and a jazz festival. Soon we're off to Zanzibar. And through most of it Anna has been keeping us company. We thought we weren't sociable, but I guess we are more people-friendly than I expected. Bring on nice quiet uneventful summer.